Irrigation water is the lifeblood of the Grand Valley. The dams and canals were difficult to build and are costly to maintain. Early attempts to provide water to this arid desert failed. Our irrigation history is complex and filled with surprised. 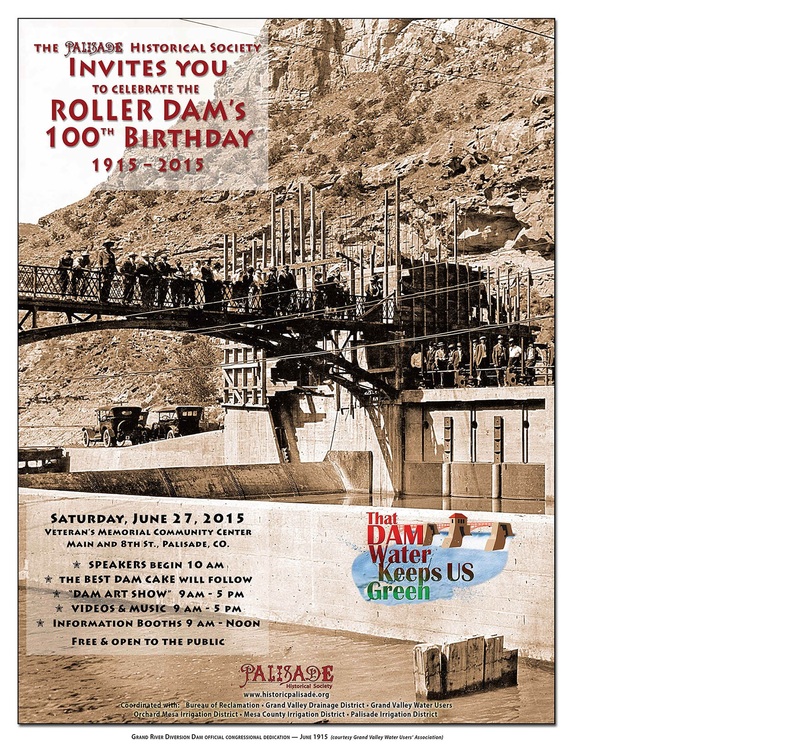 For Palisade, the keystone project is the Grand Valley Project, which consists of the Grand River Diversion Dam and the Government Highline Canal which serves five of the seven canals in the Grand Valley. The Grand River Diversion Dam in DeBeque Canyon supplies five irrigation canals in the Grand Valley, including the Government Highline, Price, Stub, and two Orchard Mesa Canals. 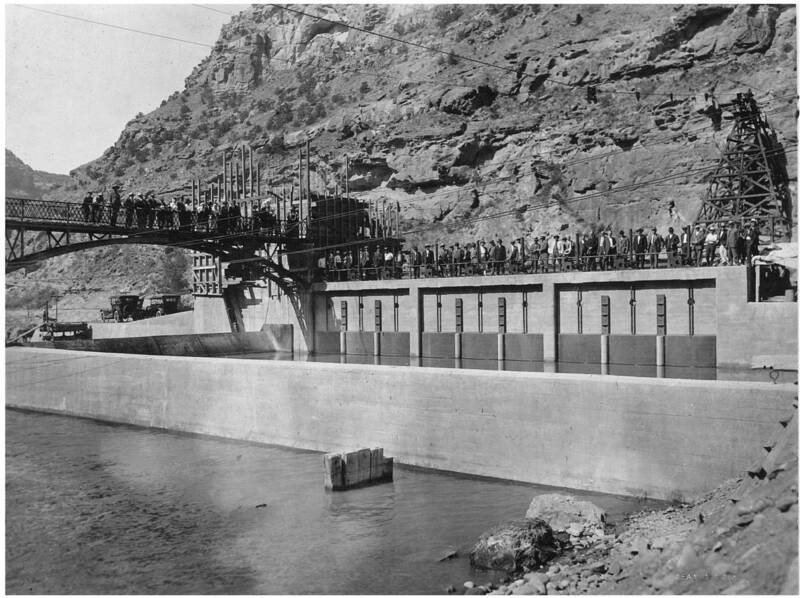 Though envisioned in the 1880s, work on the Grand Valley Project dam and 57-mile main canal began in 1897, and took nearly 20 years to complete. The dam is comprised of seven large steel cylinders, or rollers, hence the “Roller Dam.” It was designed to keep the level of water behind the dam constant and prevent flooding the nearby railroad tracks. Water was turned into the Government High Line Canal at the Congressional Dedication on June 29, 1915. It was the successful solution to make the Grand Valley into one of the most productive agricultural regions in Colorado and the Intermountain West. 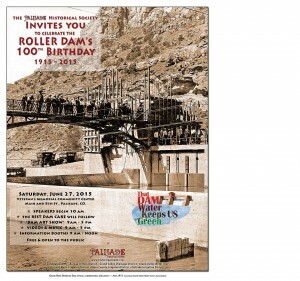 The Veteran’s Memorial Community Center in Palisade was filled with an overflowing crowd for the “dam birthday party” held in June 2015 to celebrate this wonderful dam which provides irrigation water for 50,000 acres in the Grand Valley. 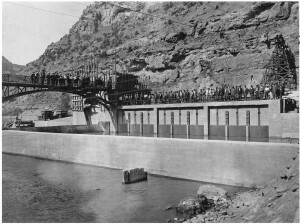 The Palisade Historical Society was successful in shining a light on this important, though lesser known, diversion dam which uses Colorado River water to grow food locally. The fun event featured interesting and historical information about the “Roller Dam” and Government Highline Canal with 43 entries in a “Dam Art Show,” speakers, highlighted by Congressman Scott Tipton, information booths, documentaries and videos about the Roller Dam and the Colorado River, as well as our “mobile museum” with never-seen-before historic photos. Master of Ceremonies was Mark Harris, General Manager of the Grand Valley Water Users’ Association which currently operates the Roller Dam. Other speakers were Ed Warner from the Bureau of Rec-lamation, Bill Fitzgerald, great-grand nephew of Wayne N. Aspinall, and Max Schmidt, Orchard Mesa Irrigation District. Following the speakers, Dorothy Carver Hines cut the first of Slice ‘O’ Life Bakery’s three “dam” birthday cakes which were quickly consumed by an appreciative crowd. Dorothy grew up at the Roller Dam as her father, John Earl Carver, was caretaker of the Dam for one-third of its 100 years. The Mesa County Libraries also created a video for the 100th birthday which is available on YouTube. For details and photos of the 100th birthday party held June 27th, 2015, see the special newsletter under the Newsletter tab on this website. The extensive, 139 page, handwritten minutes of the Grand Valley Water User’s Association from October 1904 to August 1916 were transcribed into a searchable PDF document by Gary Hines with assistance from Charlene Weidner, Jaime Cox, and Peggy Sharpe.